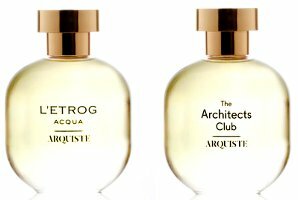 Niche line Arquiste will launch two new fragrances, L'Etrog Acqua and The Architect's Club. The last launch from the brand was Boutonnière no. 7 in 2012. L'Etrog Acqua ~ a woody citrus summer-wear flanker to 2011's L'Etrog (the brand's best selling fragrance) developed by perfumer Rodrigo Flores-Roux. The notes include myrtle leaf, cedrat, lemon, mandarin, petitgrain, bergamot, labdanum, cedar and vetiver. The Architects Club ~ a woody vanilla celebrating the smoking room at Claridge's in Mayfair, with juniper berry, angelica, lemon, bitter orange, pepper, rosewood, guaiac wood, oak, vanilla and amber. Arquiste L'Etrog Acqua and The Architect's Club will be available in 100 ml Eau de Parfum. The second one sounds more intriguing but I can’t smell them all, I will probably forget about these. I will remember — I like this brand. Haven’t sniffed any from this line, perhaps I should? Second one sounds great, but it does give me note vibes of Velvet Rope (top notes seem to say it might be going for a gin or vodka martini thing with a luxe woody panel-y drydown), especially given the name) – although I’m sure with Arquiste it’ll be much better quality all round. Are you saying that based on the listed notes, or have you acutally smelled L’Etrog Aqua? Did you meet that dishy Carlos Huber? Sure I did! It was great talking to him, and we took some photos together. This post reminds me that I really liked Fleur de Louis…lots of orris root. Neither of these is calling, thank goodness. I wore Fleur de Louis today. It is luscious. My go- to.